Completed recipe! All naturally gluten free. What that is going, take out a large cutting board shake small salt and pepper on the cutting board and drizzle some olive oil. 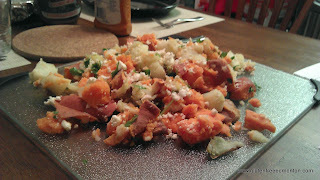 When microwave is complete, lightly break up the potatoes and then dump ontop of the herb and seasoning mixture. Gently take knife and make large chops of the potato, after scooping with knife under mixing chopped potato with herbs and making more large chops. 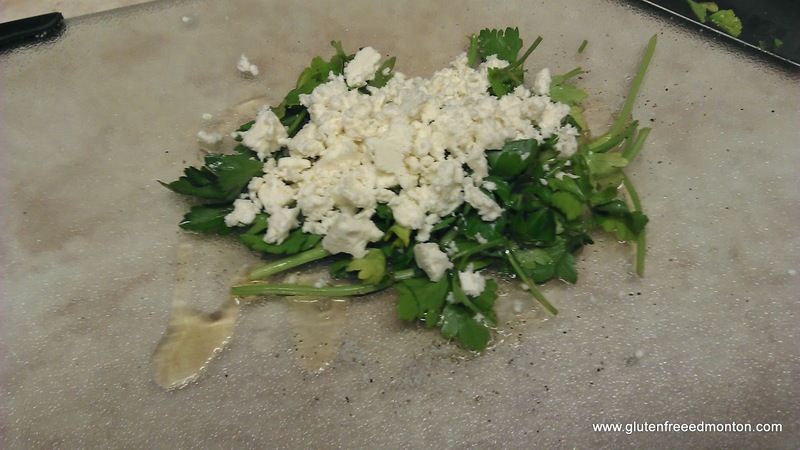 Keep on chopping and scoop/mixing with your knife until feta, and herbs is thoroughly tossed through and potato is chopped into chunks. Jamie Oliver recommends serving straight from the cutting board, because "why use more dishes if you have too?" I agree! Let us know what you think of this all natural gluten free recipe. 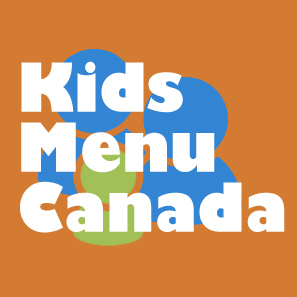 It looks like a storm may be brewing between the Canadian Food Inspection Agency (CFIA), Restaurants and the Celiac community over gluten free menu's at restaurants. What started it all? Boston Pizza's gluten free menu. 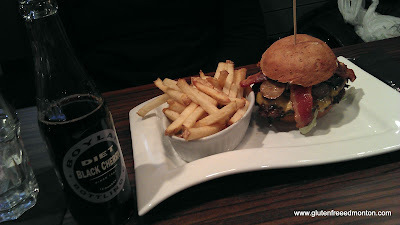 The blog Gluten Free Ontario first the article "Boston Pizza - Why Gluten Free Menu was Pulled". If you read the article it quotes an email from Boston's Pizza's current Communications Manager. I tried contacting Boston Pizza for further information, but I got the exact same response. I kind of expected that because being from a Marketing & Communications background myself, I would be doing the same thing, to make sure there is only one message getting out. 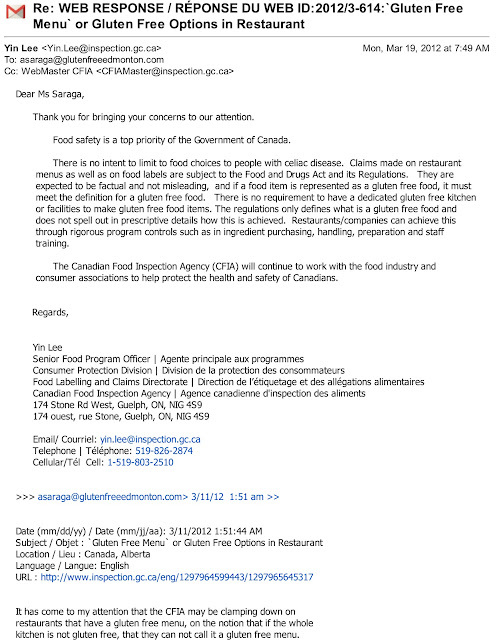 Essentially Boston Pizza said that the CFIA said items on the menu were not classified as gluten free. So their gluten free menu was pulled. BUT DON'T PANIC, Boston Pizza still offers their gluten free pizza! "Any clarity on the blog post above, or statement on what restaurants will be asked to do or not to, to accommodate this diet in their establishment will be great. Currently, we are very happy with how restaurants are accommodating, and being open to serving a gluten free meal, and yes some with a separate gluten free menu. Life will be made extremely hard for the 1 and 133 Canadians that have Celiac Disease if establishments are inadvertently scared off from accommodating this diet." I essentially am worried that all the restaurants looking to accommodate the gluten free diet will be scared off and will opt to stick with only their "regular" menu and offer no options for those needing gluten free meals. I wanted to confirm if this was an isolated case where Boston Pizza had non-gluten free items on the menu, or if they were trying to claim that because it is not a dedicated gluten free kitchen you can't truly have a gluten free menu. The term "gluten free menu" has become a savior when going to restaurants looking for a gluten free meal so Celiac's can more easily filter out what is safe and what is not. As always Celiac's keep in mind the notion and the possibility of cross contamination, which is why it is important to be diligent. I did get a response back from Yin Lee, Senior program officer with the CFIA which seemed positive. My take on this, Boston Pizza messed up somewhere in their process of some of the gluten free menu items, or some of the ingredients in the menu items were not actually gluten free. Personally I was not even aware that there was a gluten free menu at Boston Pizza, only that there was gluten free pizza available. I am happy to see that the Canadian Food Inspection Agency is working with the food industry, however I would still like to see public involved in this. Don't leave the consumer out! Let us know where you stand! IGA comes from the same family of grocers as Sobey's, except that Sobey's is corporate owned, and IGA is franchised so they are individually owned instead of corporate owned. This means that IGA stores can be more customized to the community than Sobey's can. A bit better buying power when trying to get more variety or a custom order of products. 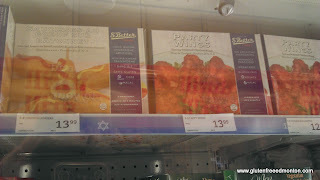 Andy's IGA in Edmonton's west end is not only known for Edmonton's best place to shop for kosher food for the Jewish community, but they have the best selection when it comes to kosher for Passover. Strolling around Andy's IGA, we noticed a lot of gluten free foods. Because they are part of the Sobey's family of grocers, they have the same signage with a nicely indicated gluten free section with a purple sign. Lately, manufacturers have been becoming creative with their kosher for Passover foods. I think it's inspiration from gluten free foods. You can now find more Passover gluten free foods that are great, not only for gluten free Passover cooking but for gluten free cooking in general, and Andy's is carrying a lot of these products. Instead of using crushed up matzah (matzah meal), more creativity is happening with potato starch, ground almonds and other gluten free ingredients. You won't find rice flour used during Passover, because that is also a grain that most of the Jewish population are not allowed during this time. 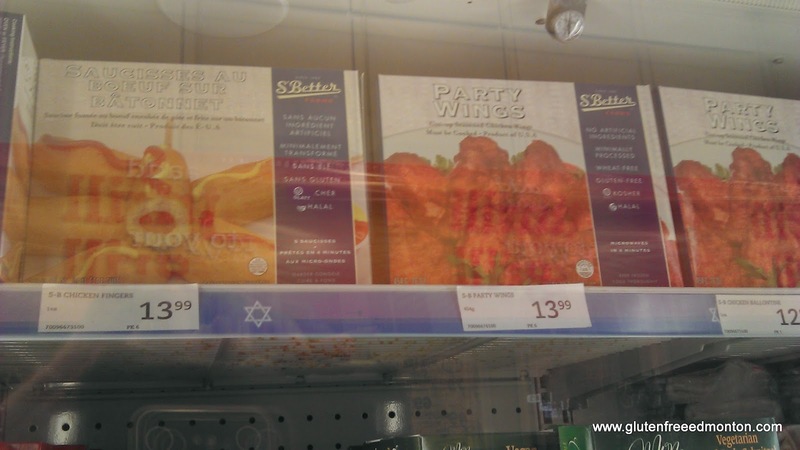 Right: gluten free kosher chicken wings. 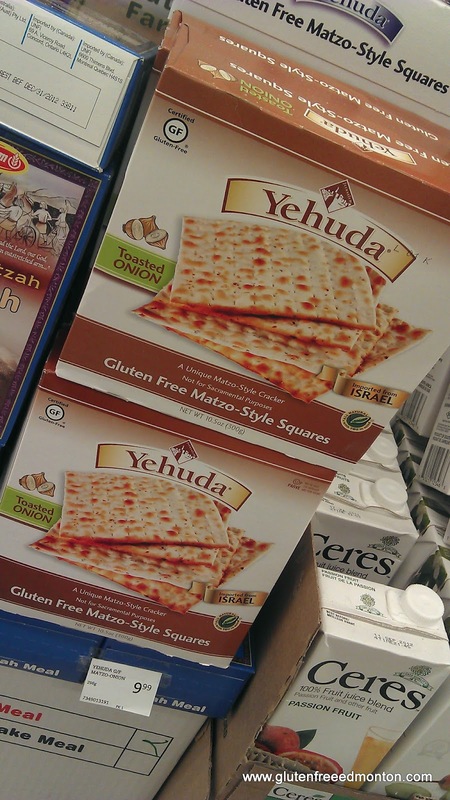 A while back I talked about Yehuda's Gluten Free Matzah that you can order online. To my surprise, IGA not only had this matzah in stock, but it was cheaper and they had it in onion flavour. Even though Passover hasn't started yet, I couldn't wait to try the gluten free matzah and it tastes great. It's also a total bonus that it is not as heavy and hard on the stomach as matzah. Other gluten free foods and kosher for Passover foods we saw at Andy's IGA is gluten free corn dogs! Yum! We didn't buy them but certainly were tempted along with the gluten free chicken wings they had. Considering they were kosher and gluten free, they were actually priced pretty well. Amanda also picked up some gluten free Passover noodles for soup. They were on sale for 2 for $5! She is so excited about having noodles for her soup. 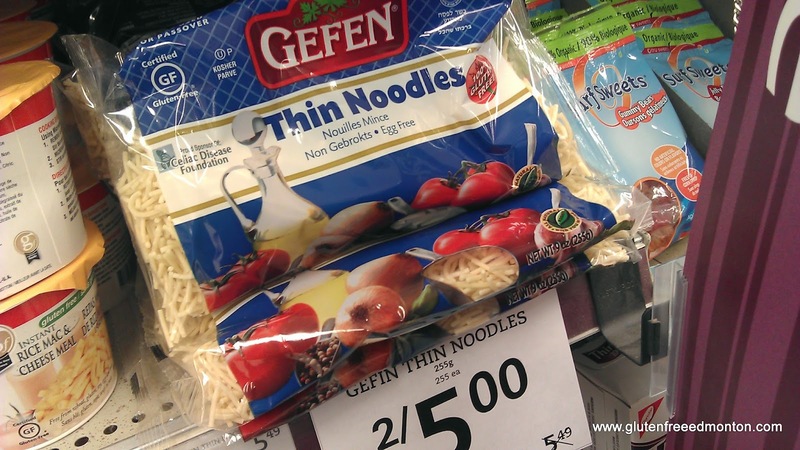 The noodles were made by Gefen who often make gluten free kosher foods. 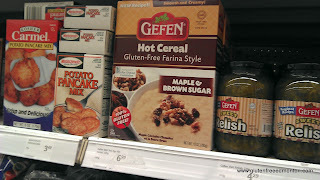 They also had a Gefen breakfast cereal in the style of cream of wheat (obviously without the wheat). 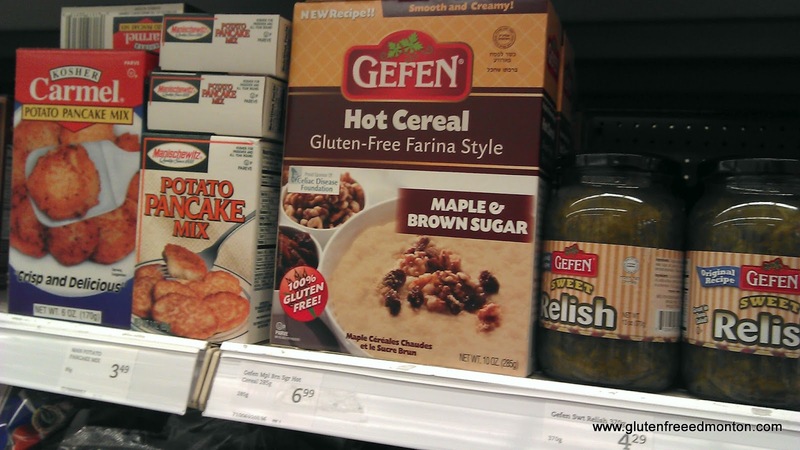 The Gefen products that are labelled gluten free often have a certification on it by the Celiac Disease Foundation and the Certified Gluten Free certification (GF) as well. 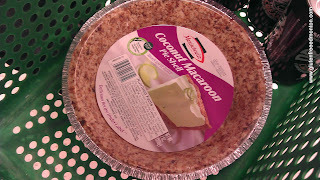 Another great gluten free kosher for Passover buy from Andy's IGA was a gluten free pie crust made by the popular kosher brand Manishewitz. The package is not labelled gluten free, but does not have any gluten ingriedients because it is made from coconut. Like I said before, kosher for Passover is trying to move away from crushed matzah to make everything and move towards more creative ingredients. When we last visited Century Grill in Edmonton's south side, I mistakenly came off as the Celiac at the table instead of Amanda (because I was holding the gluten free menu). So I just decided to play the part. Two things stuck out the most for me as the meal went on. One was right off the top when the waitress was telling me about the special (this is not to knock the experience because it was great), but she mentioned the burger, but added "I guess that wouldn't apply to you". So at first, I was thinking to myself "huh? what does she mean?" then I was like "ohhhhhhhhhh, because I'm 'Celiac'", then I paused and thought "Wait a second, that wasn't nice to single me out". They could have recommend a alternative special, or just could have done without that comment. The second thing that stood out was when dessert came, because when it did came, I didn't believe it was gluten free. Now actual Amanda having Celiac Disease beat me to the punch and asked the waiter that served it "Wait, is this actually gluten free? ", and yes it was. But that was certainly a happy feeling of disbelief. If that makes any sense. 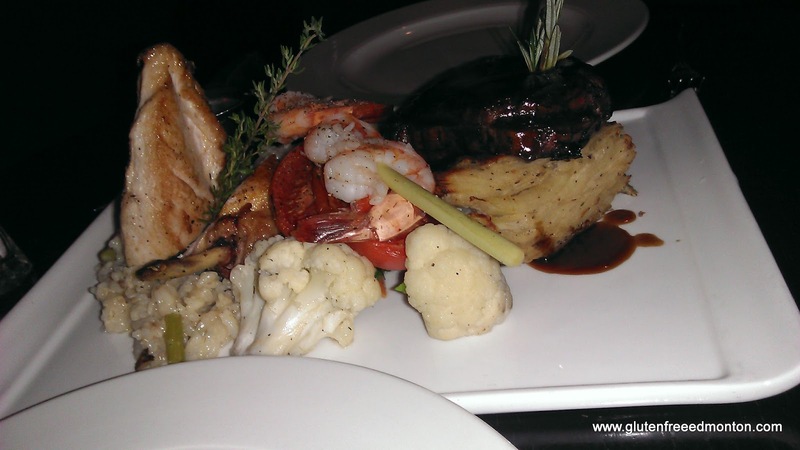 Okay, so now to the good stuff, our shared experience at Century Grill. Besides that remark from the waitress, Amanda and I had a great time. Let me start off by saying that both Amanda and I agree that Century Grill is doing it right when it comes to putting together a gluten free menu. Their gluten free menu didn't contain a bunch of asterisks saying, you can have this but without a sauce, or without seasoning etc. Their gluten free menu is built for someone with Celiac Disease, with fully seasoned and sauced menu items. Also, one of Amanda's pet peeves is when gluten free only means pasta's and pizza's, because what about the steaks and chickens? are those gluten free too? because they usually are, and Century Grill understood that. 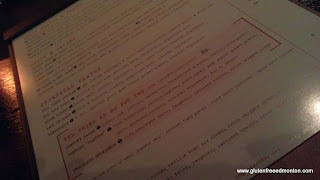 The gluten free menu is not as big as their regular menu, but it did have plenty of options. We tried the "That thing we do for two" which is a $80 three course meal and well worth it. After Amanda compared it to the same item on the regular menu, she noticed there was not a difference. You got a salad each (we upgraded to Ceasar Salad no croutons). After the salad they brought out the entree on a platter that had a tenderloin, potato gratin with goat cheese, a risotto, pan seared chicken with sauce, shrimp skewer and grilled tomato with seasoned vegetables. It was a pretty big pile of food for the two of us. The potato gratin was so tasty and rich with the goat cheese, and the steak was done the way wanted it. Amanda loved the chicken, and ate most of it over the steak. The dessert is what through us off, because they brought out us out each a piece of chocolate cake and couldn't believe it was gluten free (you have to love when that happens). 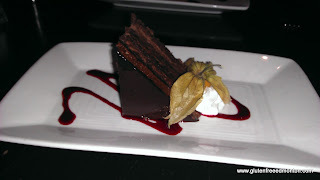 It was deliciously layered with chocolate mouse and cake about 3 times over. Mmmmmm. chocolate. 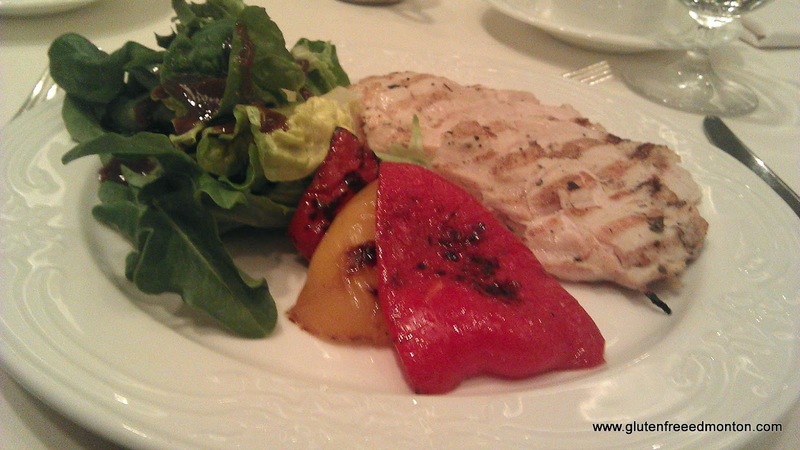 Click here to check out Century Grill menu's including their gluten free lunch and dinner menu. Hope you enjoy. Simple, delicious and gluten free! This recipes was given to me by a friend at work who has recently learned how to cook. Previously, like many, she was a "from a box or the freezer" kinda eater, but lately she's really branched out and is trying to make new things. This one is pretty easy, and easy is good in my books. Steamed Sesame Vegetable MedleySimple steaming retains vitamin content. In medium bowl, combine vinegar and soy sauce. Whisk in oils until combined. For broccoli: Trim stalk into florets; cut florets in half vertically. Steam over boiling water, covered, for 8 minutes or until crisp-tender. For carrots: Steam, covered, over boiling water for 5 minutes or until they just yield to the tip of a knife. For snow peas: Steam, covered, over boiling water for 1 minute or until crisp-tender. For beans: Halve beans. Steam, covered, over boiling water for 8 minutes or until crisp-tender. In large bowl, toss vegetables with sauce until combined. Garnish with sesame seeds. Serve hot over quinoa or brown rice. Make ahead: Vegetables can be steamed 1 day ahead. Refrigerate, covered. Warm before serving. Sauce can be made 3 days ahead. Stir before using. Add sesame seeds just before serving. I recently was invited to Vancouver to speak at a Social Media Workshop in healthcare. The workshop was part of a Quality Forum hosted by the BC Patient Safety & Quality Council. The presentation was for work with my employer and not the work I do with this blog. The conference was being held at the Four Seasons Hotel, and the conference organizers asked if there were any dietary restrictions. So I turned to Amanda and asked "Hey, should I ask for gluten free meals?" Amanda's actual response was "Why would you want to do that, you don't need it. I wouldn't if I could, I'm sure the meals won't be as good." My response "Challenge accepted!". So off I go to Vancouver as a psuedo Celiac. I contacted @gfvancouver for some extra tips in the downtown area and off I went. But for this post, I'm going to focus on my conference experience. Also I will note that this blog post is entirely about the food and my experiences and I assure you that I was actually working & learning and not just eating all day long. The first breakfast comes around. Nice light breakfast setup for the 1st day, bagels, breads, cream cheese, danishes etc. 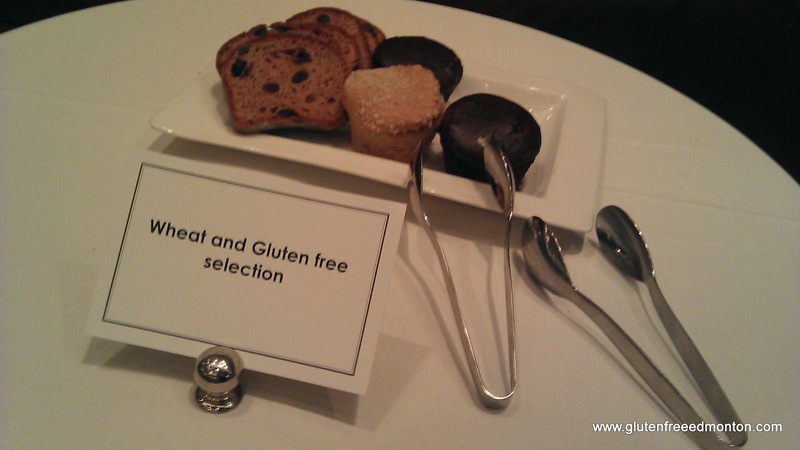 I sought out the banquet staff and asked about gluten free options, as I had let the organizers know about "my dietary restrictions" in advance of attending the conference. The gentlemen pointed to the corner where they had some slices of gluten free cinnamon raisin toast and muffins. This is where I really played the part, the celiac part I mean. There were butter balls on the table next to it with the coffee, except it looked like crumbs were around from those eating non-glutenfree. So I grabbed a jam and went off to eat. I would have preferred the butter, but things didn't go all my way that day. Already I see some of the frustrations, but was still impressed. It looked like it was possibly Udi's gluten free products. Since what I was eating was essentially the same as what others were eating, I did not get some of the odd stares at the difference in food options and questions that Amanda has described at the last conference she attended. Next up lunch. For everyone else, wraps, wraps and more wraps, with an Asian salad. Once again, I saught out banquet staff for a gluten free meal. Immediately he brings me to the bar where a grilled chicken breast seasoned with basil and lemon juice, with a side of grilled veggies and salad, no dressing awaits me. I didn't notice the lack of dressing right away, so I turned around and asked about dressing, and they responsed, "oh, the dressing has soy sauce in it so you cannot have it". I asked "Do you have another dressing instead?". They were happy to help me out with a balsamic. When I told Amanda about that experience, she said that's pretty much what happens all the time to her, the assumption that plain is the only option when the sauce/dressing contains gluten. I found it weird that this happens so often, because you would think they would just have a different dressing ready, even just olive oil & vinegar, nothing fancy required. Oh well, the meal was good, got some looks this time, because my meal looked much better than everyone else's meal did (chuckled to myself). So I knew in total, this was a three day conference, and was hoping for some creativity throughout. Breakfast, was a full out buffet, breads, eggs, bacon, potatoes etc. I saw the bread and muffins off to the side again, this time with some potato in a separate container. The banquet staff said it was dairy free and gluten free potato. I assume someone else was not able to have the potatoes in butter. 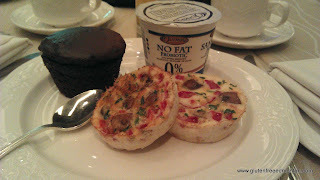 I grabbed the gluten free bread, gluten free muffin, and pulled out some bacon from the buffet, and skipped on the egg. Not too bad, I know that being a pseudo-celiac for the weekend, I had less to worry about at a buffet with regards to cross contamination, but I did think about it. I also know that Amanda will eat at buffet, but very carefully. Four Season's did seem like the type of place that would make me a separate egg if I requested. Once again, not too many looks from other attendants at the conference with regards to the breakfast differences, more of the same as the day before. Off to lunch, I was served what everyone else was, except for a different salad. Everyone else had a Cesar Salad with a huge crouton on it. I guess they didn't want to serve without the Crouton? So I had a salad with balsamic dressing again, but had an excellent pan fried chicken breast with an amazing sauce au jus, broccoli, and a multigrain rice. For dessert, a bowl with fruit, as I was not able to have the cheese cake. Amanda mentioned that happens often as well for dessert. So overall so far so good. This is where I learned that it just must be tough for people to be creative for breakfast. As someone with no cullinary training I don't know why breakfast is difficult, as I find it to be an opportunity for creativity every weekend (in our kitchen). So this time at quick glance I only see the gluten free muffins out. At the large buffet breakfast, there's quiche, breads, sausage (sitting on top of bread to soak up the grease), and yogurt parfait with oats on top. Nothing really looked gluten free friendly. So here I go again, asking for more food, after all, only gluten free muffins? I was offered some gluten free bread, but I was actually not looking for more starch, but for some protein. I was pointed to something I'd missed at the buffet, an egg white fritata. The banquet staff said they could ask the kitchen staff about the sausage, however, I told them not to as the sausages were put on top of bread (to absorb the grease), there was too much risk of cross contamination. I also asked if they could make the parfait without the oats, and they came back to me with some plain yogurt. Either way, serving a gluten free breakfast did seem to be a struggle, another thing that Amanda has spoken about before when attending conferences. At the last lunch for the conference the one meal they had had no trouble with (creatively), and once again still no trouble with serving up gluten free. Carrot and curry soup (same as all the other guests), and a nice pesto garlic gluten free pasta, which looked similar enough to what all the other guests were eating. 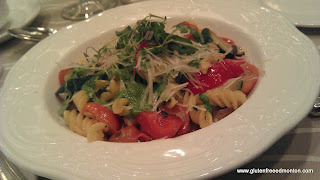 Except the guests had wheat pasta :-) Then dessert, well, I didn't get the rhubarb crumble, so once again fruit. However, at least this time it was a fruit salad instead of just chopped fruit. 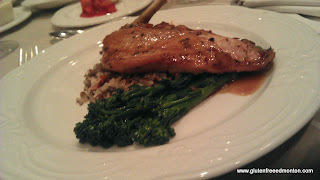 All in all, the food was pretty good and it was an interesting experience at the conference. Having conversations with people about Celiac Disease, spreading the good word of good gluten free food, and dispelling the myth's (and of course working & learning for my job). Putting up with comments like "That's just horrible, I don't think I could go without...". It actually made me feel bad and a bit uncomfortable myself, I can't imagine what it feels like for Amanda. Attending a conference? 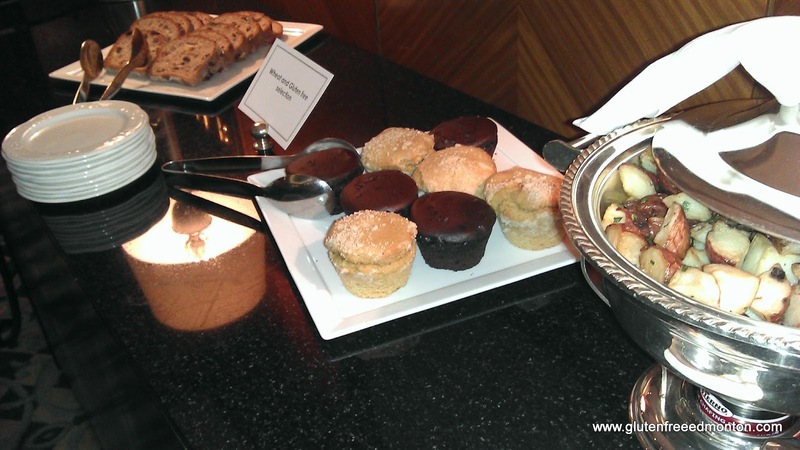 Check out some of these gluten free tips when attending a conference. Adding gluten free options to your restaurants menu? I recently had a Twitter conversation between @Block1912, @macgyyver, and @taybad. It started off with @taybad seeking out gluten free beer in Edmonton, and turned into a discussion with Block1912 looking to add gluten free menu items. So that brought up the question, what advise do you give a restaurant or cafe that wants to add gluten free menu items? I couple of @macgyyver tweets explained it best. Gluten free shouldn't mean just no sauce, it gluten free also shouldn't mean just salad. Amanda often says, that it is nice to have a gluten free menu, but often menu items that are naturally gluten free are left off the menu, making her second guess ordering the item. When it comes down to it, its a matter of knowing what the ingredients are, weather it is just a roasted chicken or chicken fingers. What is in it? Is it gluten free as-is? Can we modify the item to be gluten free without taking away from it. Once some of these questions are answered, then you can mark it as gluten free. Celiac's just don't want gluten free breaded items, they want to be sure they can have a roasted chicken with a gluten free sauce too. If you have sandwiches, do you have a gluten free bread alternative? Alternative gluten free pasta and pizza crusts? Do you have a dedicated fryer for gluten free items to avoided cross contamination with deep fried breaded items? If you have soups, what do you use as a thickener? If it is flour, can you use something else? 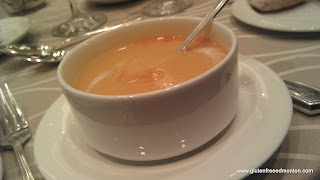 We were recently on a Princess Cruise, and they would give Amanda the same sauce, they would just give it with no thickener to her (made a special batch). She liked it, she was getting what everyone else was getting, instead of "You can have the chicken but no sauce", because lets be honest, who wants no sauce? Is your restaurant too busy to avoid cross contamination? Make some compromises to accommodate, it's worth it. Press'd The Sandwich Company offers gluten free sandwiches now. Which is great. There Jasper location you can order anything off the menu which is even better, but they had to compromise on their City Centre location which gets slammed at lunch time. They were worried about not being able to keep the work stations clean and uncontaminated. They decided for the City Centre location to have a feature sandwich of the day. So they only have to worry about prepping one type of sandwich for that location. I think everyone appreciates the effort. Now onto desserts. Which is hard to come by, although we are seeing a few more places offering something besides a bowl of fruit or ice cream. But there is certainly limited choices in pastries. The only pastry chef I can think of that does gluten free is the owner of La Crema in St. Alberta. He sells for re-sale too. You can find his stuff in a couple of the gluten free stores. Kinnikinnick obviously also has great gluten free bakery items at their store. I heard Ed's Gluten Free store is opening up their own bakery inside as well. The Next Act Pub by the Old Strathcona farmers market in Edmonton has recently started to serve gluten free options. Currently they only have a gluten free poutine on their menu, at first they started to serve gluten free gravy as an option but have since switched to gluten free gravy on their regular poutine as well. While they only have one option on the menu the servers and kitchen staff are very knowledgeable about cross contamination and take the needs of a celiac very seriously. There are very few restaurants that I would trust to adapt something on their menu for me but The Next Act pub is definitely one of them. Theu last time that I was there they made a gluten free steak sandwich for me. I was not expecting any bread with it but the server came back to me after delivering the order to the kitchen to let me know that they had some gluten free bread and asked if I would like to try it. In the end I had a wonderful steak served on gluten free bread and could not have been more pleased with their understanding and willingness to make sure my meal was both delicious and gluten free. While they are still experimenting with gluten free options I expect the them to add lots to their menu in the near future. We heard that they were looking in to gluten free beers. Kosher for Passover Gluten Free Matzah! Woo hoo! 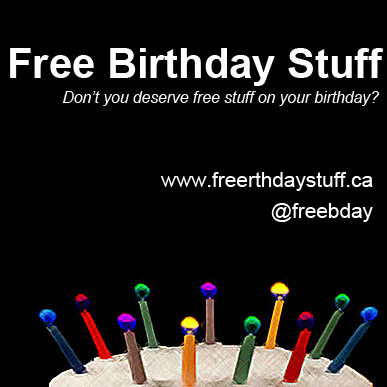 I found this through an ad that actually showed up on our web site! Go figure, so now they are getting some free promotion because this looks like a must have by the Jewish population that suffers from Celiac Disease. Already, Passover is kind of a savior for people with Celiac Disease, because kosher for passover products are often made gluten free, except when it comes to matzah. Lots of potatoes and potato starch is used in cooking. Although Nancy, Amanda's mother has made a great gluten free matzah ball soup. I've always been looking for decent gluten free matzah to try, I have found a couple, but was much too costly and not worth trying... until now. Yehuda, makes what they call gluten free matzo style squares. You can buy it 3 boxes for $40, 6 for $70 or 9 for $99... etc. Their website says it is made kosher for passover as well. That is why you gotta place your orders now for Passover as it is approaching soon. Ground shipping to Canada is free, which takes 2-3 weeks. You can pay extra for over night. I think I am going in on some orders of this. On the website, they also have a couple extra kosher items to buy like gluten free kosher nutella, gluten free kosher macaroons, and even a gluten free kosher for Passover cookbook. Order it now at www.glutenfreematzo.com or you can buy the Matzah at Andy's IGA with their kosher for Passover foods. This may not be available all year round at IGA, but will be available online all year around. The Sherwood Park Celiac Support Group has partnered with the Allergy Asthma Information Association (AAIA) and YWCA YoWoChAs Outdoor Education Center to provide an opportunity for children with Celiac disease to attend summer camp. The camp is open to children 6 - 15 years of age and will be held at the YWCA YoWoChAs Outdoor Education Center (80 km west of Edmonton, AB) from July 23 to 27, 2012. The Celiac campers will participate in all camp activities, but the meal and snack menu has been modified to be gluten-free. The Food Allergy and Celiac Summer Camp will provide children and teens with celiac disease the chance to participate in a traditional summer camp. Children with Celiac disease won't have to worry about the food being safe for them to eat or if it will make them sick. They can just enjoy going to camp and being kids. For questions regarding the gluten-free menu, please contact Cathy at spceliacs@gmail.com or (780) 467-6170. Contact YWCA YoWoChAs Outdoor Education Centre at (780) 892-2660 or yowochas@ywcaofedmonton.org for any other questions. Registration begins on February 21, 2012 and runs until the end of June, I believe. YWCA YoWoChAs Outdoor Education Centre handles the registration. Only 20 spots available for children with Celiac Disease. My non-Celiac friend ranted and raved about Soda Jerks Restaurant and how it is his favourite burger joint now. 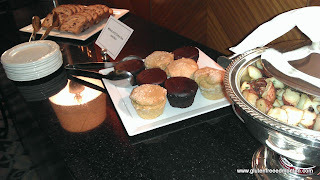 He ranted and raved so much, I emailed them about their gluten free options and blogged about them right away. You can read the post Gluten Free Burgers at Soda's Jerk's in Edmonton's West End. When I emailed them, they had nothing but good news. They carry gluten free buns, they'll put your hamburger on a bed of lettuce, dedicated fryer for french fries, all the good stuff. But up until now, Amanda and I only had my friend to go by. We recently checked them out and were floored by their burger. I'm actually ready to tour them as one of the best burgers in the city by far. Nice big juicy patty with all the fix YOU want on them. They have a few pre-set burgers as specials, but other than that, you get to build your hamburger. Kind of liked Chopped Leaf but with a hamburger. The pic here is not the gluten free bun they use. We brought in an Udi's gluten free hamburger bun because Amanda wanted to be sure she had the carb count right on it. They had no problems with that, and didn't even give a funny look. Was just a "no problem, we'll take care of that for you". And to the left, yes, that's also a Diet Black Cherry soda from Boylan. 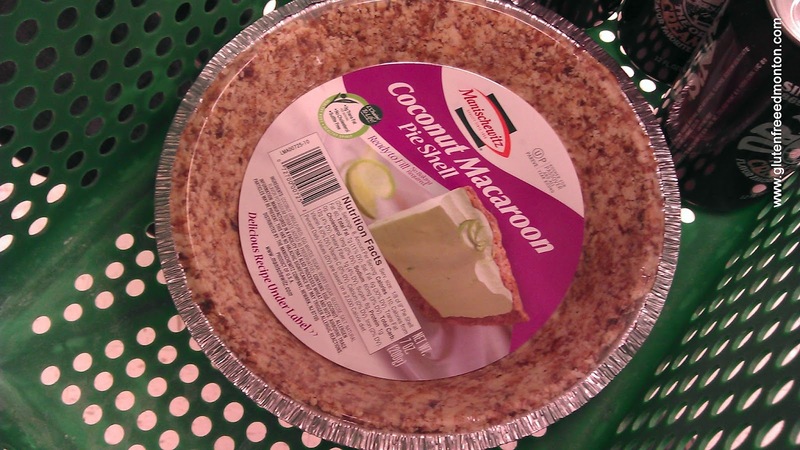 Something that Amanda loves as a treat, but you can never find the diet versions. They have a large selection of specialty bottled sodas that are to die for! Soda Jerks is also all about the marketing deals. You gotta visit their website at www.sodajerksrestaurant.com and sign up for their newsletter for all sorts of daily specials and coupons to print off like two for one's! You can visit Soda Jerks Restaurant in the West End at 17520 100 Ave.